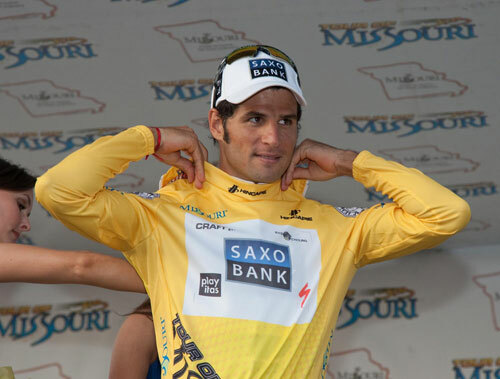 The 2009 Tour of Missouri has so far been a battle of the sprinters, with the race lead changing hands faster than the bunch finishes as Juan Jose Haedo (Saxo Bank) won stage four and stole the leader’s jersey from Thor Hushovd. With double stage winner Mark Cavendish (Columbia-HTC) withdrawn from the race due to illness, Thursday’s stage to Jefferson City was a straight duel between Haedo and Hushovd. The Norwegian’s Cervelo team tried to set up their leader for the sprint, but a crash en route to the steep, uphill finish derailed the white-and-black express. Haedo almost got caught in the mess, butkept his composure to take the win. Hushovd came home in second, with Quick Step’s Dario Cataldo third. Although tied on time with Hushovd, Haedo earned the right to wear the leader’s jersey purely because he won the most recent stage – both riders have each won a stage and have the same number of second and third places. Close. It’s unlikely that the overall classification will be so close after Friday’s 30.5km time trial stage around Sedalia. And it’s a given that Haedo will lose his first ever leader’s jersey to one of the specialists against the clock. Eatch out for US TT champ David Zabriskie (Garmin-Slipstream), Levi Leipheimer (Astana), Gustav Larsson (Saxo Bank) and Michael Rogers (Columbia-HTC). Rogers is currently the highest of these four overall, at tenth, so has less time to make up over his rivals. Mark Cavendish elected not to start stage four. The British sprint ace withdrew from the race under team doctor’s orders due to a respiratory infection. The 24 year old will rest for a few days in Missouri and travel back to Europe with his Columbia-HTC team mates when the race concludes on Sunday, September 13. 10. Moises Aldape Chavez (Mex) Team Type 1 all same time.